How is temperature measured with thermocouples? 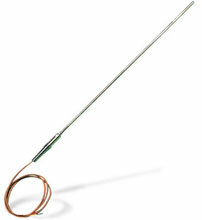 Thermocouple is probably the most-often-used and least-understood of the temperature measuring devices. Essentially, a thermocouple consists of two alloys joined together at one end and open at the other. The emf at the output end (the open end; V1 in Figure 1a) is a function of the temperature T1 at the closed end. As the temperature measurement rises, the emf goes up. The open-end emf is a function of not only the closed-end temperature (i.e., the temperature at the point of measurement) but also the temperature at the open end (T2 in Figure 1a). Only by holding T2 at a standard temperature can the measured emf be considered a direct function of the change in T1. The industrially accepted standard for T2 is 0°C; therefore, most tables and charts make the assumption that T2 is at that level. 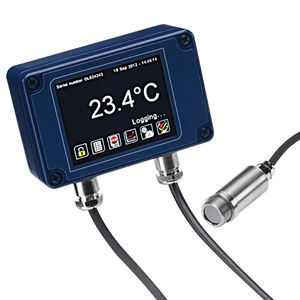 In industrial instrumentation, the difference between the actual temperature at T2 and 0°C is usually corrected for electronically, within the instrumentation. This temperature measurement adjustment is referred to as the cold-junction, or CJ, correction. The composition of the junction itself does not affect the thermocouple action in any way, so long as the temperature, T1, is kept constant throughout the junction and the junction material is electrically conductive (Figure 1b). Similarly, the temperature measurement is not affected by insertion of non-thermocouple alloys in either or both leads, provided that the temperature at the ends of the "spurious" material is the same (Figure 1c). A typical RTD consists of a fine platinum wire wrapped around a mandrel and covered with a protective coating. Usually, the mandrel and coating are glass or ceramic. The mean slope of the resistance vs temperature measurement for the RTD is often referred to as the alpha value (Figure 2),alpha standing for the temperature coefficient. The slope of the curve for a given sensor depends somewhat on purity of the platinum in it. The most commonly used standard slope for temperature measurement, pertaining to platinum of a particular purity and composition, has a value of 0.00385 (assuming that the resistance is measured in ohms and the temperature in degrees Celsius). A resistance vs temperature curve drawn with this slope is a so-called European curve, because RTDs of this composition were first used extensively on that continent. Complicating the picture, there is also another standard slope, pertaining to a slightly different platinum composition. Having a slightly higher alpha value of 0.00392, it follows what is known as the American curve. If the alpha value for a given RTD is not specified, it is usually 0.00385. However, it is prudent to make sure of this, especially if the measures of themperature to be measured are high. This point is brought out in Figure 2, which shows both the European and American curves for the most widely used RTD, the Pt100 sensor, namely one that exhibits 100 ohms resistance at 0°C. The resistance-temperature relationship of a thermistor is negative and highly nonlinear. This poses a serious problem for engineers who must design their own circuitry. However, the difficulty can be eased by using thermistors in matched pairs, in such a way that the nonlinearities offset each other. Furthermore, vendors offer panel meters and controllers that compensate internally for thermistors' lack of linearity. Thermistors are usually designated in accordance with their resistance at 25°C. The most common of these ratings is 2252 ohms; among the others are 5,000 and 10,000 ohms. If not specified to the contrary, most instruments will accept the 2252 type of thermistor. These tempeature measuring devices infer the amount of radiation emitted by a surface. Electromagnetic energy radiates from all matter regardless of its temperature. In many process situations, the energy is in the infrared region. As the temperature goes up, the amount of infrared radiation and its average frequency go up. To function properly, an infrared temperature measurement device must take into account the emissivity of the surface being measured. This can often be looked up in a reference table. However, bear in mind that tables cannot account for localized conditions such as oxidation and surface roughness. A sometimes practical way to measure temperature with infrared when the emissivity level is not known is to "force" the emissivity to a known level, by covering the surface with masking tape (emissivity of 95%) or a highly emissive paint. An infrared device is like a camera, and thus covers a certain field of view. It might, for instance, be able to see a 1-deg visual cone or a 100-deg cone. When measuring a surface, be sure that the surface completely fills the field of view. If the target surface does not at first fill the field of view, move closer, or use an instrument with a more narrow field of view. Or, simply take the background temperature into account (i.e., to adjust for it) when reading the instrument. Thermocouples consist essentially of two strips or wires made of different metals and joined at one end. Changes in the temperature at that juncture induce a change in electromotive force (emf) between the other ends. As temperature measurement goes up, this output emf of the thermocouple rises, though not necessarily linearly. Bimetallic thermometers take advantage of the difference in rate of thermal expansion between different metals. Strips of two metals are bonded together. When heated, one side will expand more than the other, and the resulting bending is translated into a temperature reading by mechanical linkage to a pointer. These devices are portable and they do not require a power supply, but they are usually not as accurate as thermocouples or RTDs and they do not readily lend themselves to temperature recording. Temperature measurements using RTDs are more stable than thermocouples. On the other hand, as a class, their temperature range is not as broad: RTDs operate from about -250 to 850°C whereas thermocouples range from about -270 to 2,300°C. Thermistors have a more restrictive span, being commonly used between -40 and 150°C, but offer high accuracy in that temperature range. Infrared sensors, though relatively expensive, are appropriate when temperature measurements are extremely high. They are available for up to 3,000°C (5,400°F), far exceeding the range of thermocouples or other contact devices. The infrared approach is also attractive when one does not wish to make contact with the surface whose temperature is to be measured. Thus, fragile or wet surfaces, such as painted surfaces coming out of a drying oven, can be monitored in this way. Substances that are chemically reactive or electrically noisy are ideal candidates for infrared temperature measurement. The approach is likewise advantageous in measuring temperature of very large surfaces, such as walls that would require a large array of thermocouples or RTDs for measurement.